Wendy Pua | Malaysia Chinese Lifestyle Blogger: 200pcs Beautylabo Colorcare Leave-On Treatment Free Testing Month! 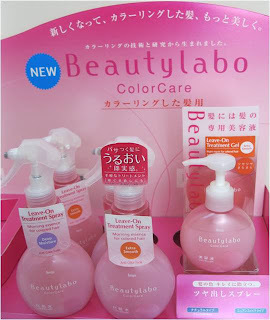 200pcs Beautylabo Colorcare Leave-On Treatment Free Testing Month! First 200 participatns who sent in thier personal details (name, contact no., I/C no. and email) to thian@hoyu.com.my with the correct answer of "What is BLCC stand for?" may stand a chance to get a full size of BLCC Spray or Gel and a Hoyu Loving Pack for free. Almost everyone colors their hair and worries about hair color damage. Hoyu, Japan hair color maker has been researching into this aspect for years and offering Beautylabo Colorcare Leave-On Treatment (BLCC) for colored hair. Leave-On Treatment Spray as the morning essence for colroed hair, while Leave-On Treatment Gel, a night repair for colored hair Anti Color Fade. 1. This contest is open to all residents of Malaysia except employees and immediate families of Hoyu Malaysia Sdn. Bhd., their advertising agencies, appointed distributors and other members related to this promotion. 2. All entries must reach to the email address within the participation date stated above, all entries after the date will not be entertained. 3. Each participant is entitled to 1 prize only. 4. Hoyu Malaysia will not be responsible for any lost, late and misdirect email. 5. Judges' decision is final and no correspondence will be entertained. 6. All winners will be notified by email blasting. 7. Hoyu Malaysia Sdn. Bhd. reserves the right to substitute any prizes with others at similar value without prior notice. All prizes are not allowed for any transferable, refundable, or exchangeable for cash. 8. Transportation cost for prizes, accommodation and transportation for collection of prizes shall be borned by winners. Collection of prizes at Hoyu Malaysia office @ Solaris Mont Kiara. 9. All prizes must be claimed within 30 days from the date of notification after which no claims will be entertained. 10. Hoyu Malaysia Sdn. Bhd. reserves the right to publish the names and photographs of the winners for publicity purposes. 11. By participating in this contest, participants agree to abide by the rules and regulations and decisions of the judges. 12. By participating in this contest, participants undertakes that it shall not bring any claims or actions against Hoyu Malaysia Sdn. Bhd. whether in contract , or otherwise.